Space shuttle Endeavour is seen being towed by a 2012 Toyota Tundra truck in Los Angeles, Oct. 12, 2012. LOS ANGELES — Why did the space shuttle cross the road? To get to the other side … of the 405. 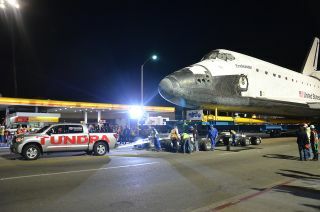 Or at least, that was the case for the shuttle Endeavour, which overnight Friday (Oct. 12) was towed by a Toyota Tundra truck over the Los Angeles freeway to complete its first day on its trip to the California Science Center (CSC) for display. Endeavour, which flew 25 times to space between 1992 and 2011, has launched on the CSC's "Mission 26," a two day, 12 mile (19 kilometer) journey through the city streets of L.A. and Inglewood. Endeavour is expected to arrive at the science center on Saturday night. Leaving Los Angeles International Airport (LAX) almost 12 hours earlier, the shuttle Endeavour spent nearly 15 hours idling in a shopping center parking lot and then outside a donut shop waiting for crews to raise power lines, clearing its route to reach the Manchester Boulevard Bridge by midnight. Space shuttle Endeavour is seen behind Randy's Donuts, an L.A. landmark on Manchester Blvd., Oct. 12, 2012.
Who do you recruit to drive a space shuttle across an L.A. bridge in a scene made for TV? A professional stuntman and an astronaut, of course! Seated behind the 2012 Tundra's steering wheel was Matt McBride, a precision driver whose credits include Toyota commercials as well as Hollywood blockbusters, such as last year's "Transformers: Dark of the Moon." Seated to McBride's right was astronaut Garrett Reisman, who launched aboard Endeavour for his first spaceflight in 2008. "I do not know how many times I have drove through this intersection going back and forth to LAX," Reisman told collectSPACE.com before the tow. "If you told me one day that Endeavour would be sitting here next to Randy's Donuts, I'd say you were crazy, but here she is." "It's weird, very, very weird, but also really, really cool," he said. Though Toyota's cameras were rolling, the tow was more than just an excuse to shoot an advertisement. To better distribute the space shuttle's weight and to meet with road restrictions, Endeavour's custom transport was moved out and wheeled dollies took the place of the four vehicles. A silver Toyota Tundra CrewMax half-ton pickup provided the horsepower to tug the orbiter over the freeway. Toyota said the truck was not modified or enhanced in any way to accomplish the tow. Toyota's participation towing the space shuttle was in support of an existing partnership between Toyota Motor Sales USA, Inc., and the California Science Center to provide support the education of the public through exhibits and programs. Toyota currently has a Tundra truck on display at the science center in an exhibit demonstrating the physics of leverage. The Tundra that was used to tow Endeavour Friday will replace the Tundra now on exhibit and will be on display after the shuttle's pavilion opens on Oct. 30. To further support the move, Toyota developed a website to provide behind the scenes videos, photos, activities for children, and details about the Tundra Endeavour project. Visitors to the website can share the content, subscribe to email alerts and use Twitter to the spread word about the Toyota Tundra's role in Endeavour's delivery. For the first 10,000 "re-tweets" sent through the website, Toyota will donate $50 to the California Science Center to support building the Samuel Oschin Air and Space Center, the permanent home for the space shuttle Endeavour.